Home / Quilts / Wonky Logs Quilt Release! 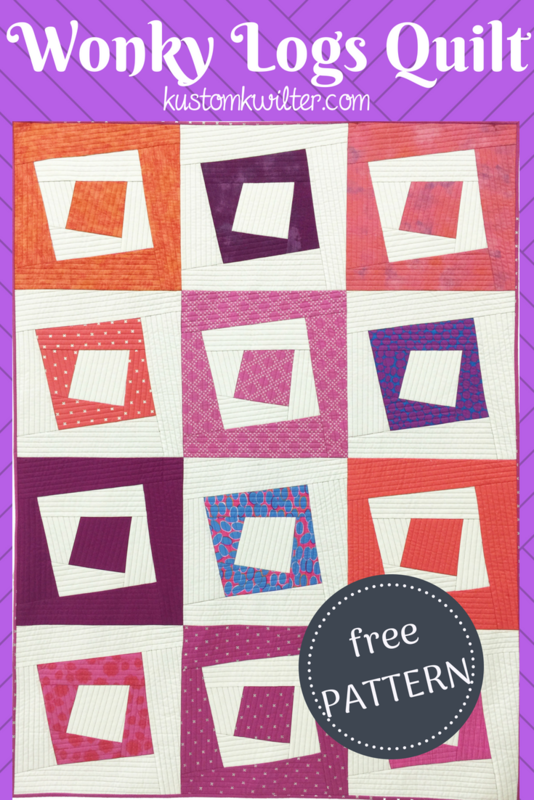 Who loves free quilt patterns?? I do! Today is the release day for the Wonky Logs Quilt Pattern (if you subscribe to my newsletter, you got access early! ), and I can’t wait to share it with you! I don’t know about you, but when I started sewing a few years ago, I had absolutely zero intention of ever making clothing. The thought of doing so actually made me break out into a cold sweat. (I promise I’m getting to the quilt–hang in there for just a hot minute!) I can still remember sitting on my mom and dad’s bed, worrying over a dress pattern that my mom desperately wanted to make for me. We (I say we, but I was mostly there for moral support 😉 had managed to cut the pattern pieces out of the flimsy tissue paper, and pinned it to the fabric that was destined to be the dress. I honestly can’t recall what happened after that, but I don’t think were able to finish it. I remember the feeling of frustration and not understanding the horribly written pattern that was intended for beginners. It was even more frustrating because my Mamaw was an excellent seamstress, and my mom didn’t inherit those skills, or really want to. Her calling is gardening and home making, and she does it all perfectly. My point in telling you this story is that it left me with a bad taste in my mouth for sewing. I didn’t attempt any kind of sewing related feat, with the exception of cross stitch, for the next 20 years. Fast forward 20 years, and I’ve gotten the basic knowledge down of quilting. I joined a modern quilt guild and went on a retreat where many of the members were making their first (or second or third) garments. I decided they could have it and waited another couple of years before finally sewing my very first School House Tunic by Sew Liberated. It wasn’t pretty, but I wore it with so much pride, you’d have thought it was Chanel (the pattern is great–it wasn’t pretty because my fabric choices were A-W-F-U-L). That feeling of accomplishment and pride–isn’t that what we all get when we complete a new challenging project? I want to encourage you to broaden your horizons and challenge yourself to take on the sewing tasks you think you’re not good enough for. That’s how I felt with garments. And now I am obsessed with sewing my own clothing and clothing for my daughter and husband. I’d like to help you get there. Okay, that was a long intro, but I needed to tell you WHY I wrote the Wonky Logs Quilt pattern. It’s free. It’s fat quarter friendly! It’s a quilt pattern you can put together with your serger. WHAT??? Yup. 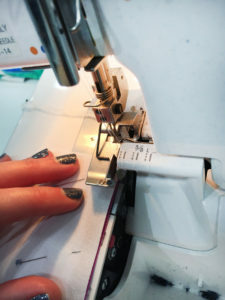 (Don’t run away just yet–you can piece it with your sewing machine too) If you don’t have a serger, no worries. You can still use the pattern with a traditional sewing machine and a 1/4″ seam allowance just like normal. If you DO have a serger, and it’s sitting in the corner of your closet with old raincoats and Halloween decorations, then it’s time to pull that puppy out and dust it off. Give it a little cleaning, find the manual and give it some oil, if necessary. 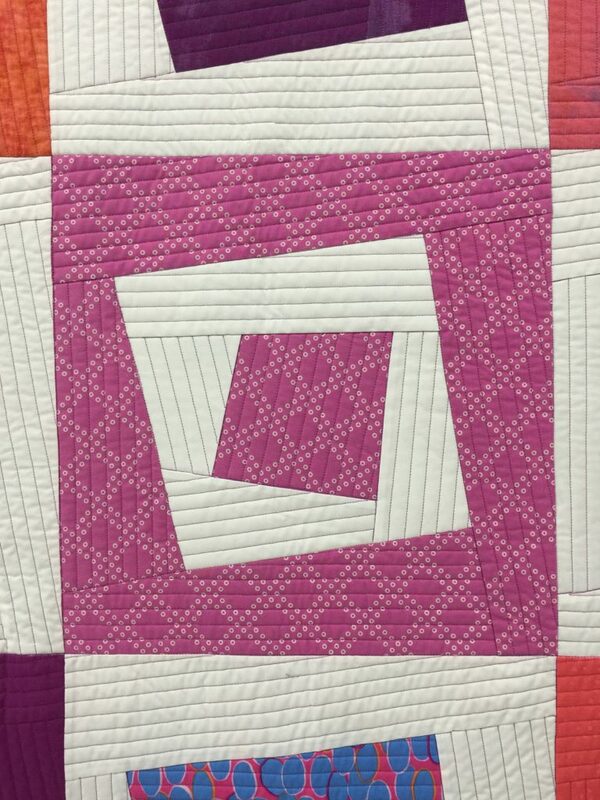 Think of this quilt pattern as your gateway pattern to garments. 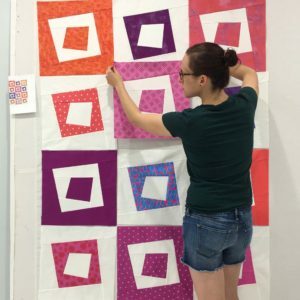 You can still have fun picking out your fabrics and making a really gorgeous quilt, but you can do it while getting to know your serger a little better. Starting to work with “wovens” with your serger will take a lot of the intimidation out of it because your fabrics won’t be stretchy like knits are. 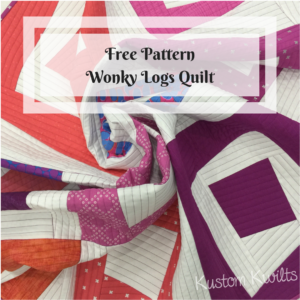 I’ll be posting more on some fun garment construction and sharing some tips with you along the way, but for now–grab your free copy of the Wonky Logs quilt pattern and gather your fabric and have fun!!! Picking your fabrics is half the fun!